JERSEY CITY, NJ – In the presence of proud family members along with Hudson County Sheriff Frank X. Schillari and other local elected leaders looking on, the Hudson County Sheriff’s Office officially promoted three officers at a ceremony today; Including the first promotion to Captain of an African American in the history of the Hudson County Sheriff’s Office, a testament to the commitment towards diversity and inclusion of the HCSO. The ceremony was held at the Hudson County Administration Building in Jersey City, NJ. 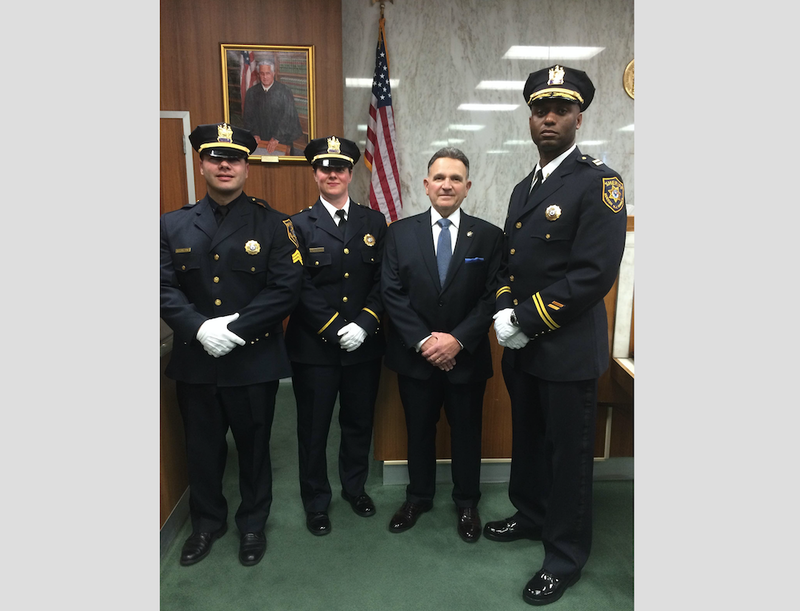 In addition to Sheriff Schillari, elected officials at the ceremony included State Senator Sandra Cunningham and Hudson County Freeholder Anthony Romano, along with Dignitaries Undersheriffs Andrew Conti, Bruce Lamparello and Francine Shelton, Chief Oliver King and the Honorable Judge Peter F. Barisso, Jr.
Pictured from left to right: Sergeant Wilson F. Alequin, Lieutenant Sharon R. Whelpley, Sheriff Frank X. Schillari and Captain Thomas Hall.